Indonesia's animal markets are stacked from floor to ceiling with cages housing all manner of creatures. The vast majority of which have been taken from the wild. A slow loris, a rare nocturnal creature bought for $5 and shown off in the hot Indonesian sun by it's purchaser, a traffic warden. No bird is safe, this Blue and White Flycatcher migrates from China and Korea to Indonesia but did not escape the poachers. A market trader showcased each of his 'products' by taking them out of their cages and holding them, showing them off to potential buyers. Species such as this palm civet were for sale. Some of the markets are portable, set up on the backs of trailers so products can be taken around towns and villages. The only way to get a young monkey like this is to kill its mother. Long tailed macaques are sold in almost every animal market. A greater green leafbird, one of the most commonly seen birds for sale in the markets. A Brahminy kite sits almost forgotten in its tiny cage. This bird was bought from a market by a power plant worker & now sits at the back of his compound beside the rubbish pile. These Scops Owls have been painted by the seller. Albino and other 'odd' looking species are much more valuable on the market. 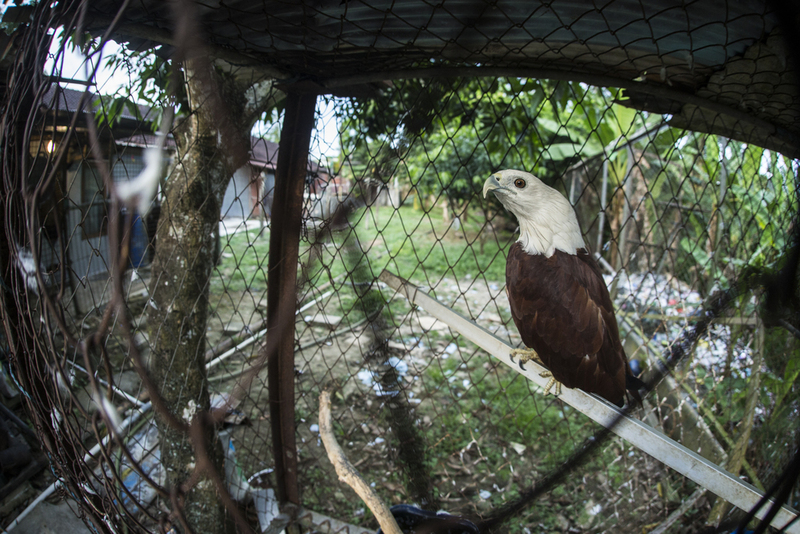 NGOs such as JAAN (Jakarta Animal Aid Network) are fighting the trade and have a specialised bird of prey rehabilitation centre on Kotok Island. JAAN also work with the Indonesian police, investigating traders and raiding them. Recovering species such as this 2 month old Sun Bear. A dolphin is kept in a tiny chlorinated pool at an attraction in Jakarta. These dolphins are captured from the Bay of Jakarta and kept in tiny pools for the public's amusement. A sun bear performs as part of a routine at a Jakarta based zoo, it's highly likely this bear was sourced the same way as the confiscated cub was.